Congratulations to Neighbor Up members! What a great day celebrating the grand opening of Simon’s Supermarket on Buckeye Road. 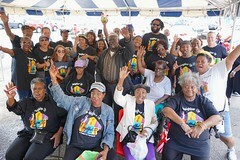 Congratulations to Neighbor Up members, who organized and advocated with hundreds of fellow residents — as well as Cleveland City Councilman Blaine Griffin and other city, county and nonprofit folks — to ensure this new grocery meets the needs, standards and aspirations of the surrounding community. Congratulations to Neighbor Up members Deborah Gray, Diane Pride-Mays, and Lorrie Yuill for speaking on behalf of Neighbor Up at the ceremony and highlighting the story of resident involvement in the grocery store campaign. And thanks to Vince Robinson, co-owner of Larchmere Arts, and Jay Westbrook for the photos. http://neighborupcle.org/wp-content/uploads/2018/12/DSC07912.jpg 4000 6000 lmills http://neighborup.wpengine.com/wp-content/uploads/2016/10/neighbor-up-logo-1.png lmills2018-10-12 15:05:462019-03-11 15:11:52Congratulations to Neighbor Up members!